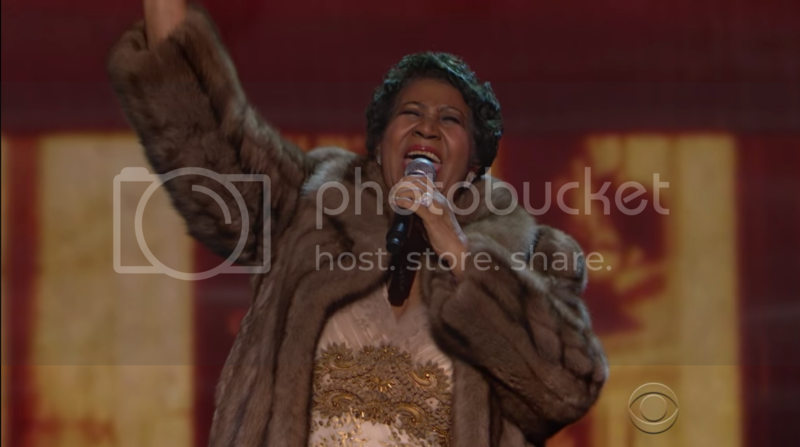 Aretha Franklin Brought Down the House With an Untouchable Performance of "Natural Woman"
Home Aretha Franklin Kennedy Center Honors performances Aretha Franklin Brought Down the House With an Untouchable Performance of "Natural Woman"
Aretha Franklin's Black excellence was on full display during her performance of Carole King's "(You Make Me Feel Like A) Natural Woman" at the Kennedy Center Honors ceremony. Franklin came to tribute songwriter Carole King. From the moment Queen 'Retha stepped on stage you knew she was going to tear it down. Aretha, whom many forget is a gifted musician, accompanied herself on the piano. Excellence can't even fully describe it. Just look. King was elated as soon as she saw her. She made the president shed a tear. And when you thought it couldn't get any better, Aretha got up from the piano. Carole continued to stan out. FLOTUS and POTUS were feeling it. And then...AND THEN SHE THREW OFF HER MINK LIKE THE SUPREME DIVA SHE IS! Honey, when that mink hit the floor, you knew it was over. Five decades later and Aretha is still the queen.